Discussion in 'Other Skills' started by NWPrimate, Aug 10, 2017. I was just thinking about your cordage rampages. What do you think of knotweed to make a similar style bag? Any fiber that will make decently strong cord would work, I'd think. 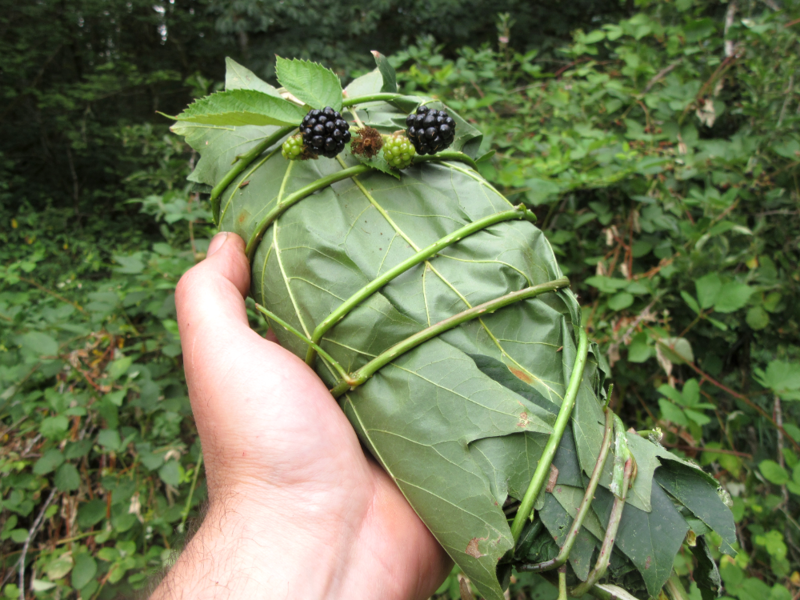 I've not messed with knotweed, but have used dogbane and raffia fiber in these bags before, with good results. Brook Trout, happywanderer, NevadaBlue and 4 others like this. 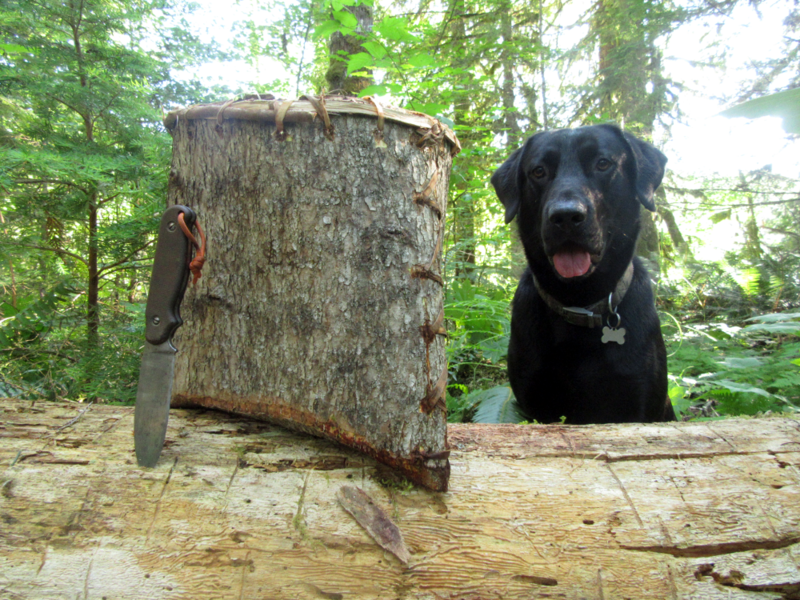 D.K, Brook Trout, field-expedient and 12 others like this. Very nice! I like the stripes. Brook Trout, Youcantreadinthedark, NevadaBlue and 4 others like this. Brook Trout, NevadaBlue, NWPrimate and 3 others like this. I have wanted to try making a folded and stitched container for a while, and finally got around to it yesterday. 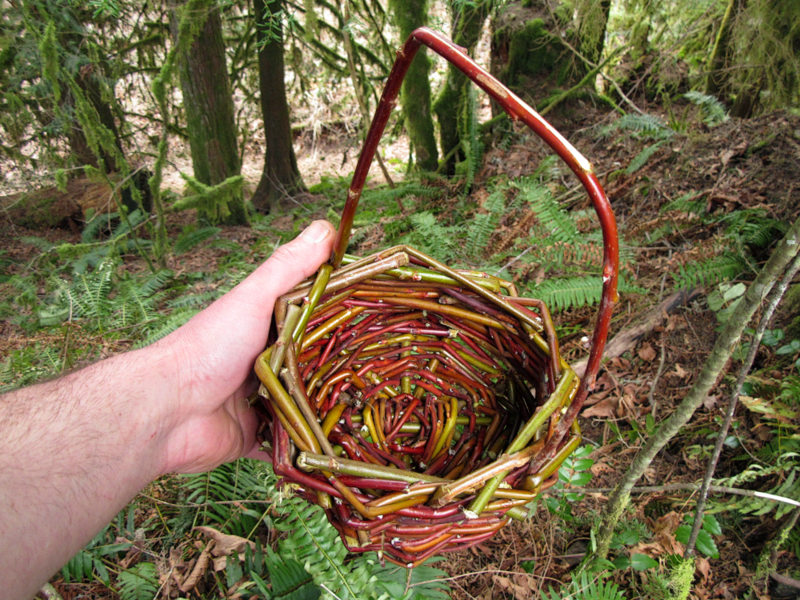 I have seen several videos on this style of basket, but was probably most influenced by this one from Tom McElroy. 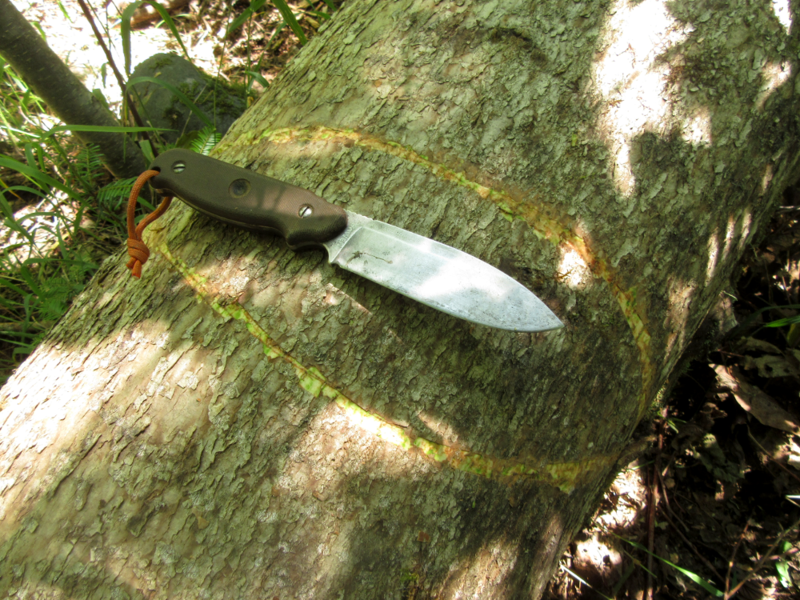 I picked out a black cottonwood with a nice knot-free section of bark and went to work peeling it. I ended up with a really nice sheet. This is definitely the biggest piece of bark that I have peeled and it got me thinking about a lot of other possibilities for this material. 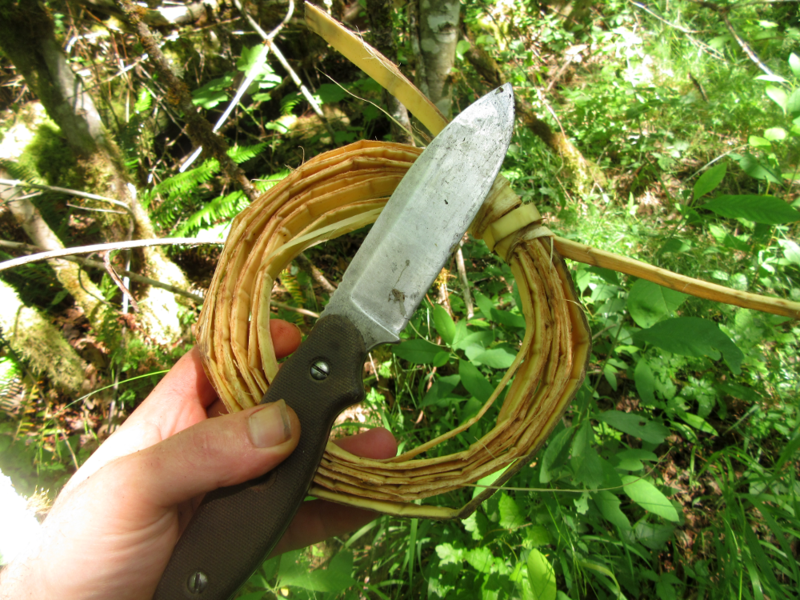 I pulled a long strip from the same tree for the cordage to stitch it up. 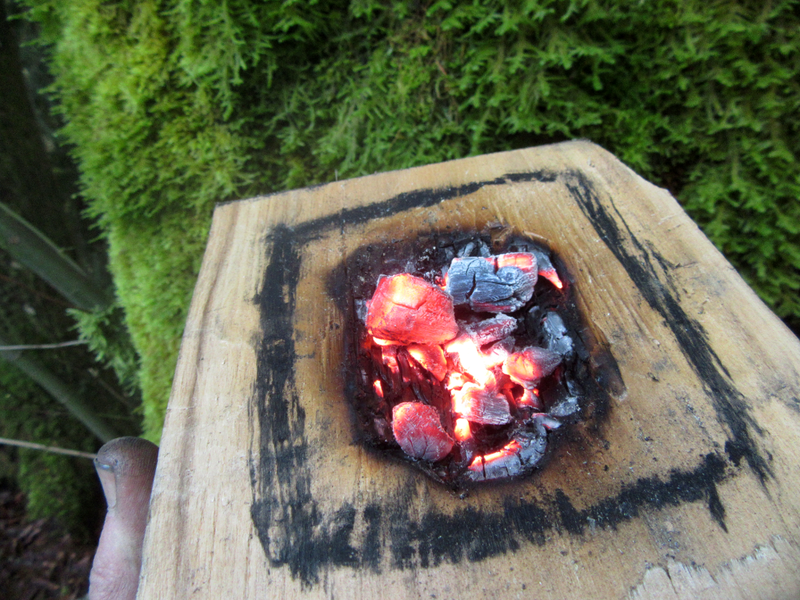 I used the laser strike to draw out a rough football shape, and scraped off the outer bark along it to guide the folds. Once I got it to fold where I wanted, I started punching holes for the stitches. 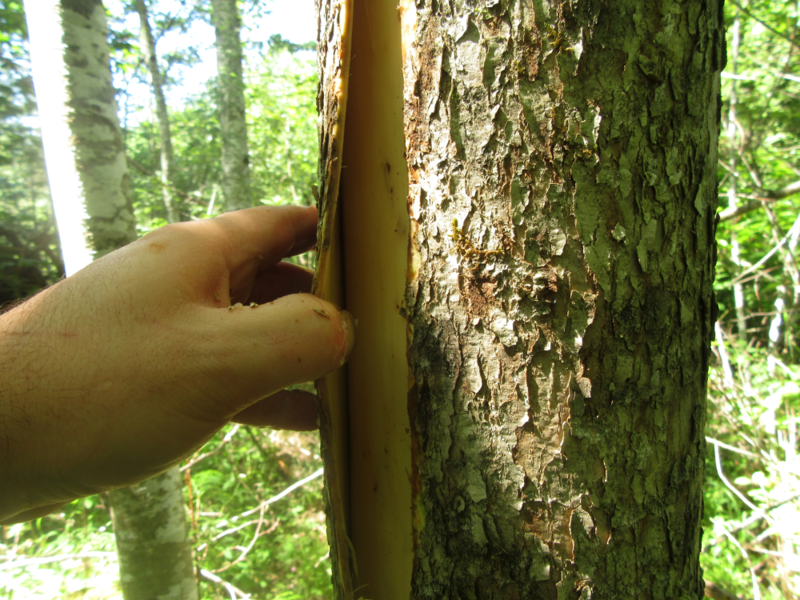 While the bark I used for sewing it is strong and was conveniently at hand, I will use roots or withies for this when I do it again. 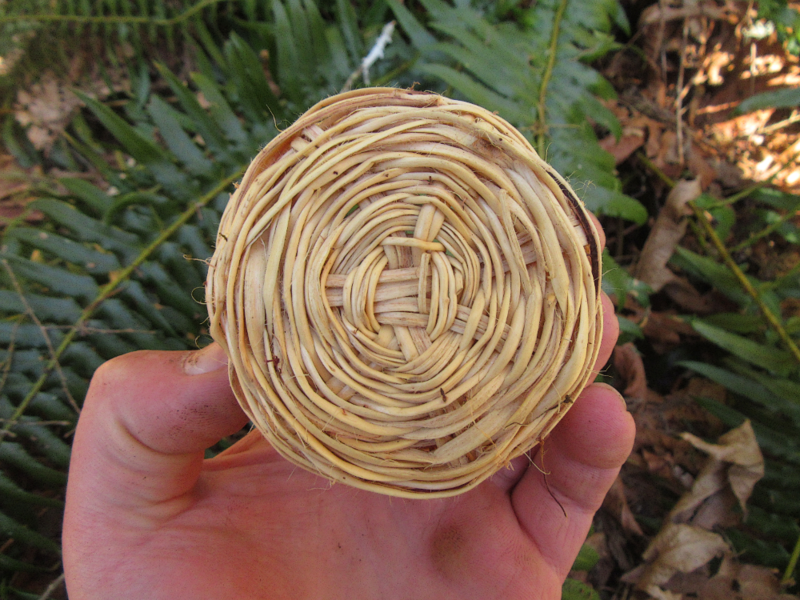 I think this bark cordage is the weak link in the basket as it could potentially take damage on the inside from the contents of the container. Roots or withes would also be easier to push through the holes, but I was able to push the strands through with a stick. Not sure how strong it would be with one set of loops, I went back up the same side again in an x-pattern. Once it was all stitched up, it felt surprisingly durable, but a rim to reinforce the top seemed like a good idea. 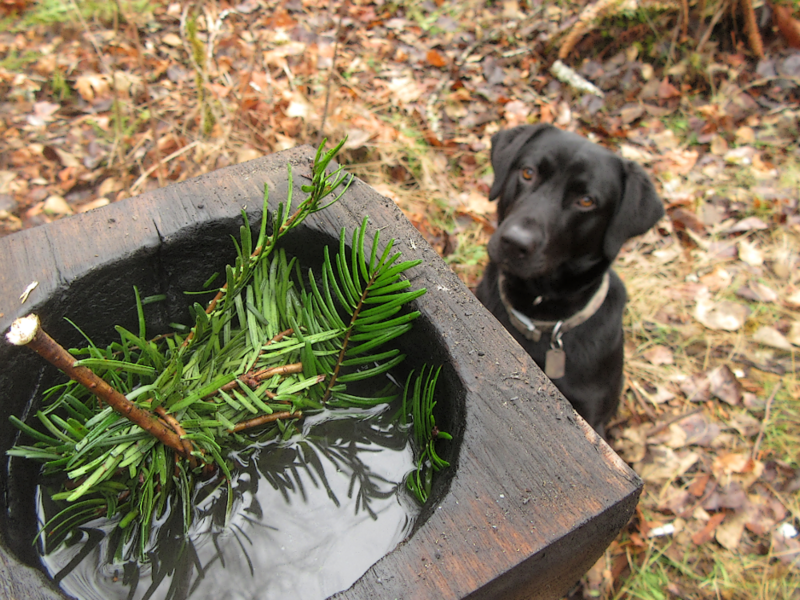 I have to admit to phoning this step in a bit, and cut a flimsy cedar withe and hastily attached it to the top. It isn’t nearly as pretty as others I have seen online, but I was still very pleased with how this came out. What it lacks in aesthetic beauty and build-quality, it makes up for in capacity. I am sure that I could make an even better one next time by using roots or withies for stitching and putting a stronger double rim on it. I considered reworking this one, but I think I will probably do some durability testing on it in its current form instead. Stitching was the most tedious and nerve-racking part of the process, but none of this was particularly difficult; even for a novice like me. Even with the added time of setting the camera over and over again, it only took about two hours and fifteen minutes, which might sound like a long time, but it’s a lot quicker than weaving. I will definitely make more of these, and be trying out different sizes and playing around with adding handles or straps. 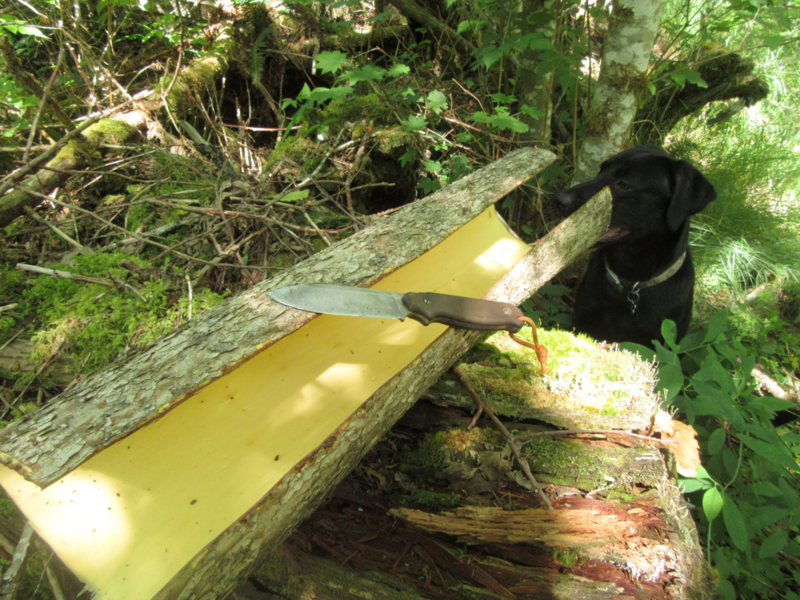 Carver 83, M.Hatfield, Brook Trout and 21 others like this. @NWPrimate NICE work! That is approaching pack basket/backpack size. Could probably rig up some shoulder straps and use it like a pack basket . Cedar roots work awesome for the stitching on bark and harden up really nicely almost to a plastic like consistency/rigidity. Brook Trout, gohammergo, rsnurkle and 3 others like this. @NWPrimate , I like that a LOT. Nice job! I'm not sure if @NWPrimate has any Cedar roots, or would know what to do with them if he could ID them. Brook Trout, Seahunter, Bitterroot Native and 2 others like this. My Aspen bark coffee canister. Road King, M.Hatfield, D.K and 15 others like this. I can definitely see how that would be an improvement. Awesome job on this by the way! Nope, no cedars around here. That is really cool @NevadaBlue ! Brook Trout, NevadaBlue, Bitterroot Native and 3 others like this. M.Hatfield, Brook Trout, Cheapeats and 13 others like this. M.Hatfield, Brook Trout, OrienM and 4 others like this. A perfect basket for the day’s gathering. CivilizationDropout, rsnurkle, RangerWeaver and 1 other person like this. M.Hatfield, CivilizationDropout, gohammergo and 2 others like this. M.Hatfield, CivilizationDropout, NWPrimate and 1 other person like this. M.Hatfield, Brook Trout, Blackhawk45hunter and 6 others like this. 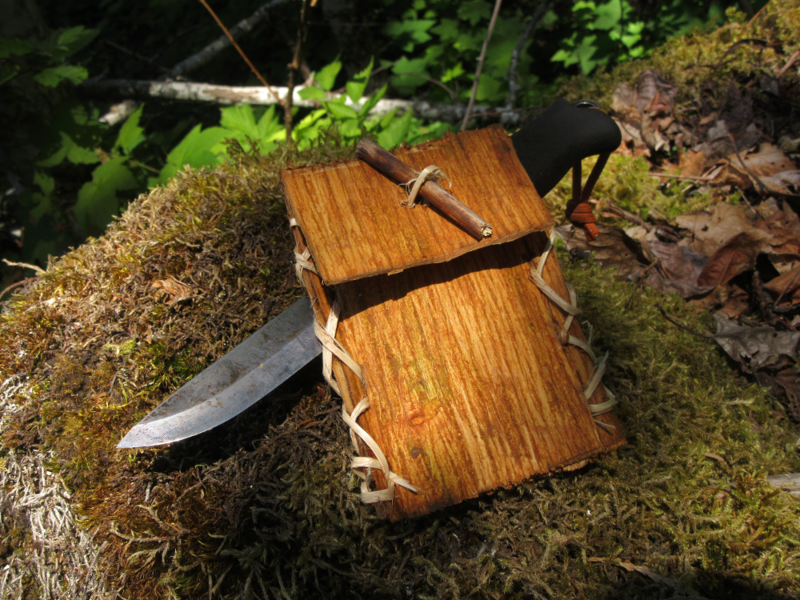 A simple and impractically small pouch made from maple bark and cedar withes. 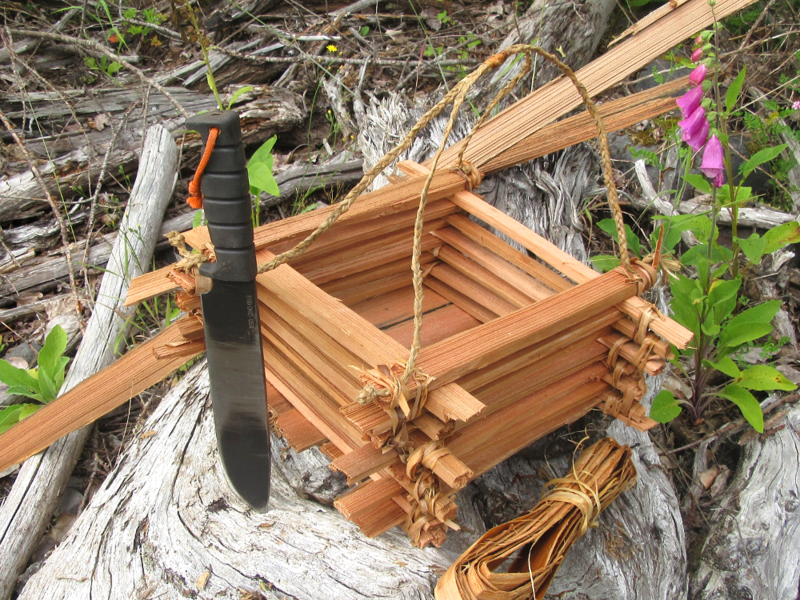 I wanted to practice using split cedar withes for stitching bark, but didn’t want to go through the ordeal of making another large basket today, so I made a little envelope style pouch. It is so small that it wouldn’t hold much or have any real practical use, but it was still a fun exercise and I learned some lessons making it. The withies worked great as they were stiff enough to punch through the holes, but still flexible enough to tie off with overhand knots. Unfortunately as it dried, the holes I punched with the knife began to run out and combine into one big split, so even if I had a use for this little pouch, it wouldn’t have withstood any real use. 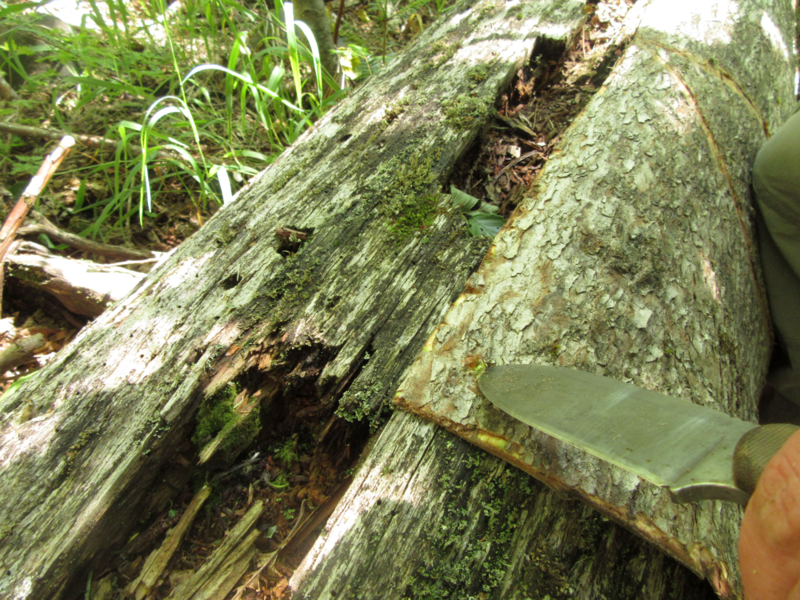 The biggest lesson for me today was that I need to find a new way to punch round holes into bark instead of using the tip of my knife to make lazy slits. The pouch itself is kind of a joke, but I learned some lessons and now feel confident in using the split withes for stitching up my next container project. M.Hatfield, Brook Trout, Blackhawk45hunter and 11 others like this. Some ideas just don't hold water. 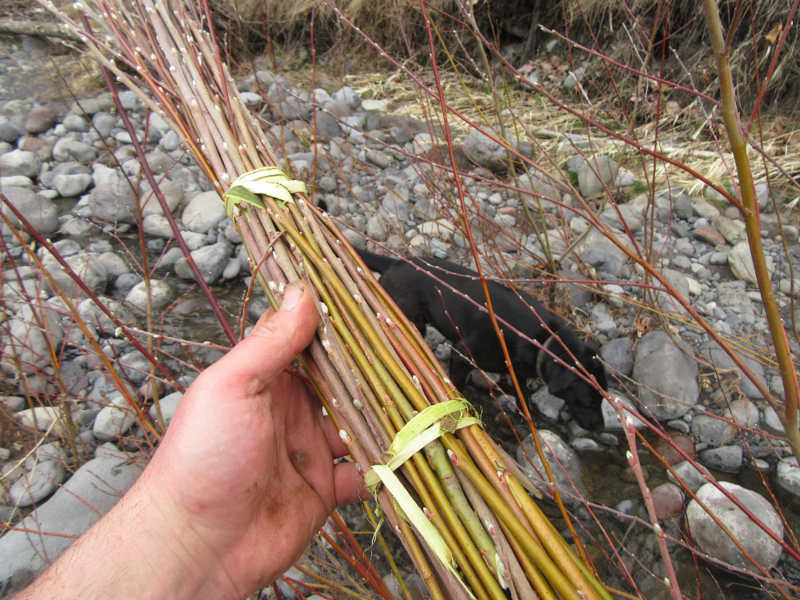 I had the thought that if I wrapped bark up tightly enough into a tube before folding the bottom over that it might hold water, at least in the short term. I recognize that if this was a viable option, I would have probably seen it somewhere before; but it was worth a shot. This might work with some pitch applied in the right places to seal it up, but the container shape itself isn't ideal, so investing the time to make glue for this design doesn't make a lot of sense. However, this container is about as simple as it gets and might be a good option for other applications. The first thing that came to my mind was that making a shorter version to hold insects like grasshoppers, crickets, or other invertebrates that you might want to keep alive for bait or to prevent them from spoiling if you were going to eat them. It might also be a decent option for holding bait inside of a minnow or crawfish trap. Punching holes in it would release the scent while keeping the bait from being eaten by the first visitors to the trap. M.Hatfield, Brook Trout, Blackhawk45hunter and 7 others like this. 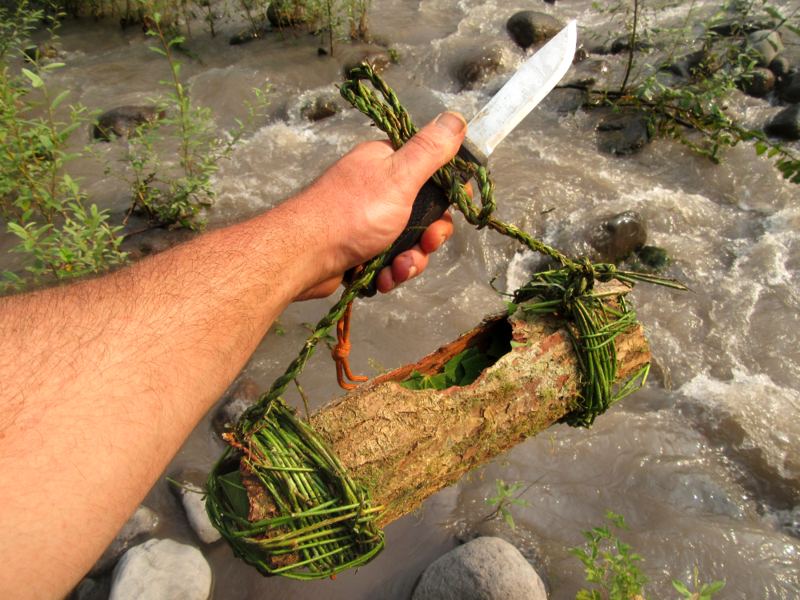 Make it short and add a some cordage for wearing around your neck and you got a blow dart quiver. field-expedient, CivilizationDropout, NWPrimate and 2 others like this. Cool pouch! I got a good laugh out of you chucking it into the creek lol! It was small but not impractically so. 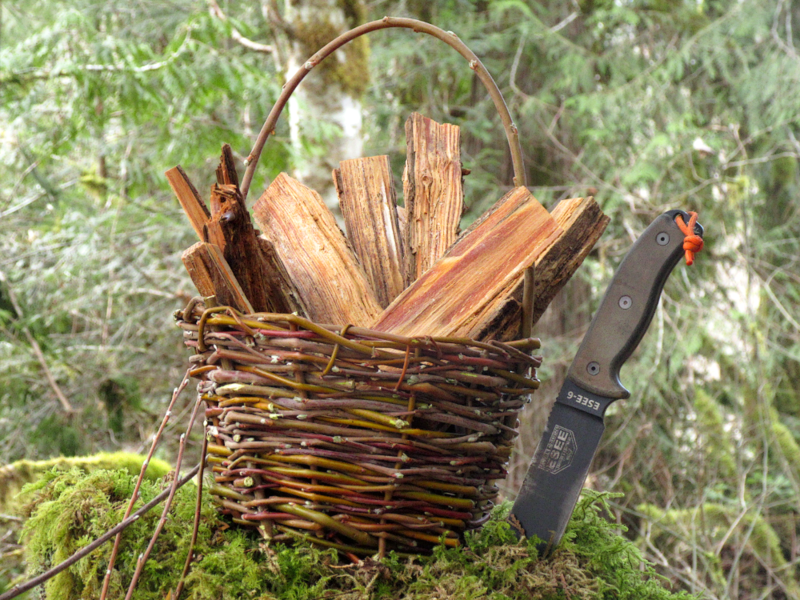 Would be good for holding small stone flakes, pieces of antler, tinder, ect. All sorts of uses! 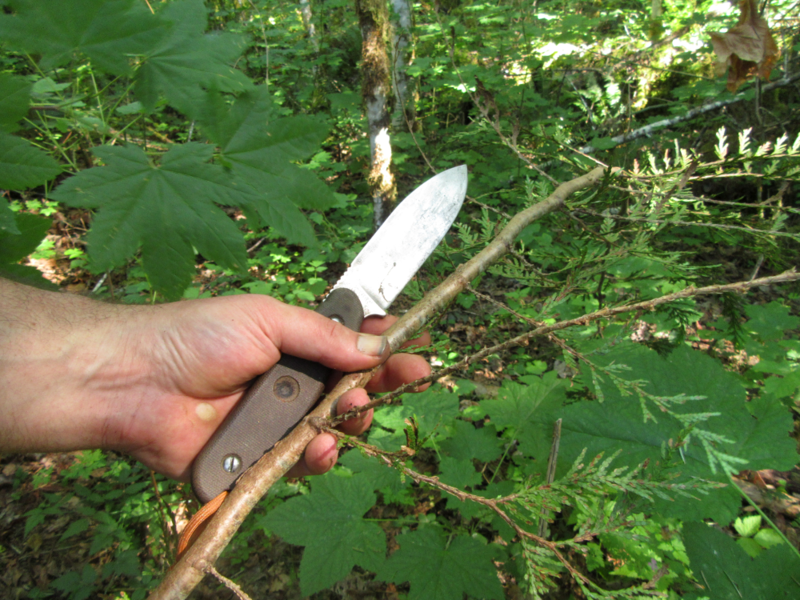 Best way to punch holes (round ones) in bark that I have found is using a piece of antler as an awl. The cone shape of the tip allows for perfect circular holes and its really easy to get them to the size you need. Punch it in then use a twisting motion to kind of bore it out. Never had any split on me. Brook Trout, Blackhawk45hunter, Sandcut and 3 others like this. 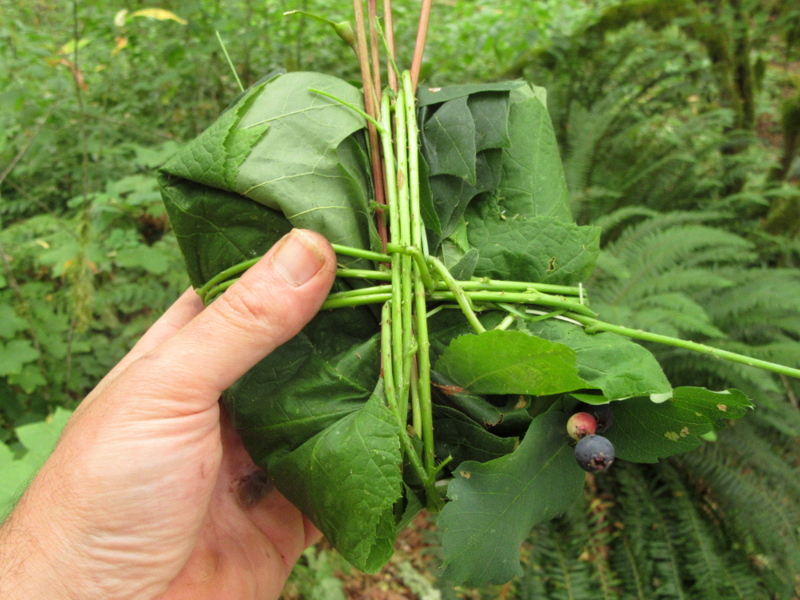 Another one-minute berry basket turned bundle; with a natural tag to let my son know what's waiting inside for him. M.Hatfield, Brook Trout, Blackhawk45hunter and 5 others like this. 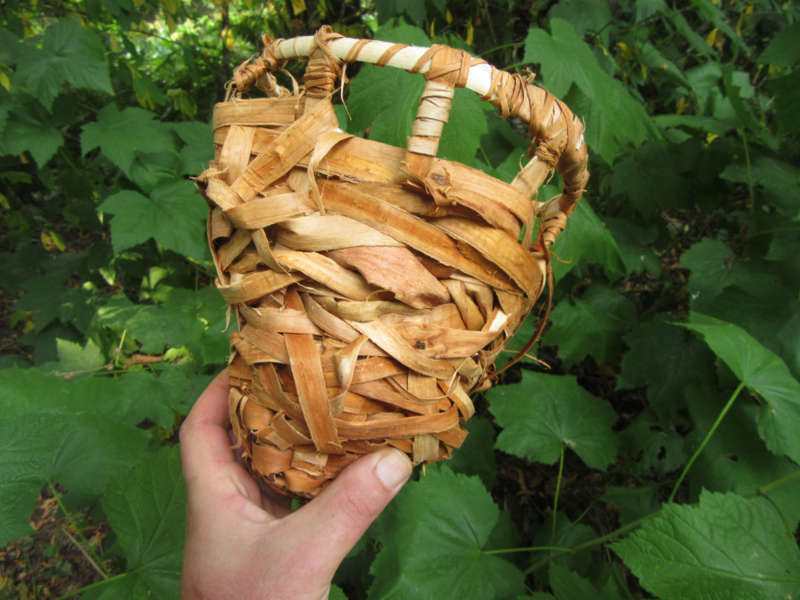 I have been having a lot of fun working with fresh bark, but am aware that it will not be very easy to harvest for much longer; so I wanted to see if I could fashion a usable gathering container from dead bark. 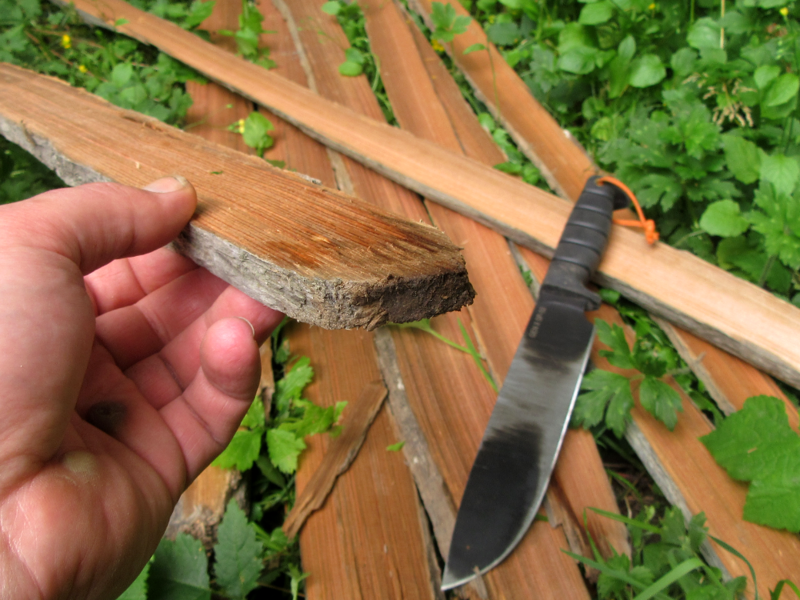 It was no problem at all to get a nice semi-circular section of bark from a dead hemlock, but when compared with fresh peeled living bark, it was obviously very brittle. For reinforcement I wrapped it up with some trailing blackberry vines and used them to cap the ends and make a carrying strap. While working on this I realized that this might be an easy solution for a crawfish/minnow trap by simply leaving it round and adding a funnel or a @field-expedient style ramp to one end. A project for another day perhaps. The whole thing ended up being a lot sturdier than I expected. 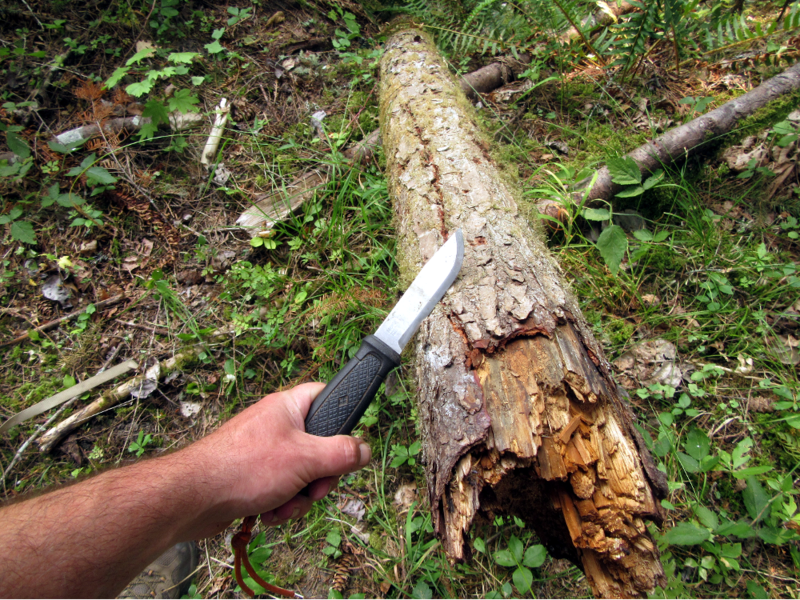 Adding leaves keeps the rotten bark off of whatever you might be gathering, and keeps things from falling through the holes in the end. For testing purposes, I filled it up with rocks, gravel, and sand before tossing it to simulate a dropped basket, and it held up great with only a small crack. I didn't get a good shot of it, but the two woven caps are secured together underneath the basket to make sure that they don't come loose and fall off. 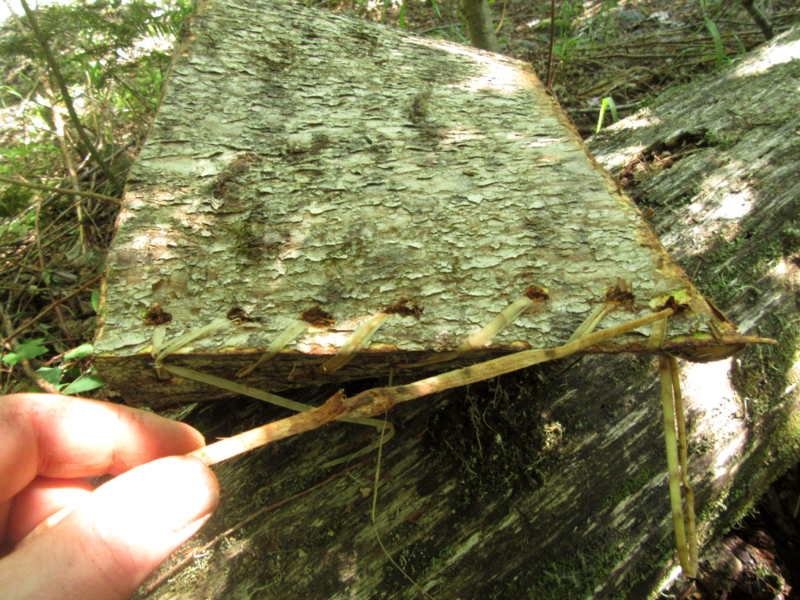 The entire vine portion could probably be refitted to a new piece of bark without too much trouble if necessary. It would be easy to add a couple of leaves and vines to close it up to travel with once you fill it with whatever you gathered. The whole project only took about forty minutes and the materials are available year round, with only deep snow being the exception, but I imagine it wouldn’t be difficult to use cedar withes as a substitute if the vines were inaccessible. M.Hatfield, Brook Trout, Medicine maker and 7 others like this. 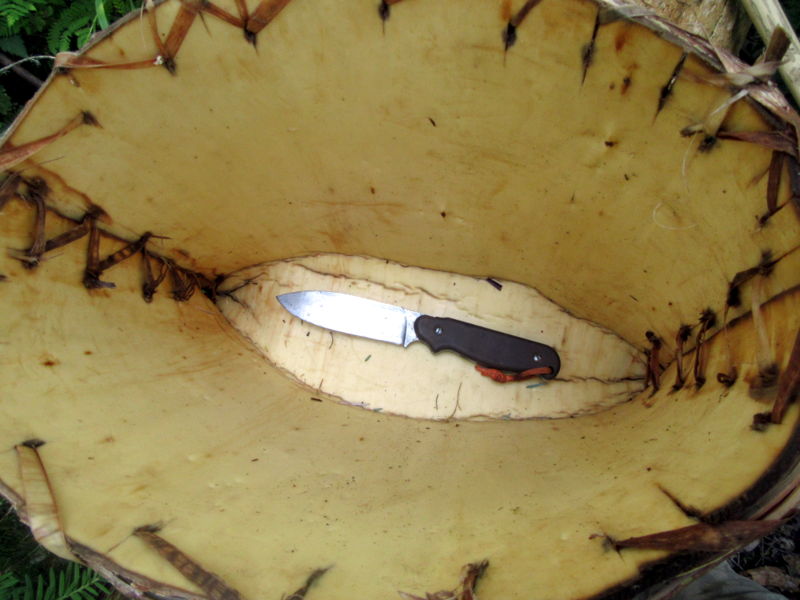 Multi-chambered canteen made from Japanese knotweed. Because the individual tubes don’t hold much water on their own, I bundled four of them together which held a total of 27 fluid ounces or .79 liters. The tubes themselves were completely waterproof and I made stoppers for them that fit like corks into the top. 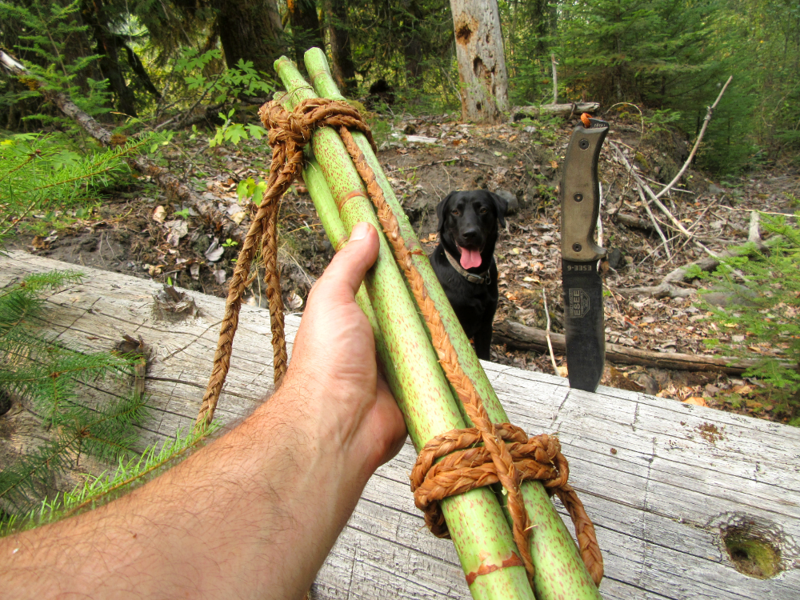 One tube ended up splitting up top, so it would slowly trickle out if held upside-down but the others were completely water tight.I carried this water bundle over my shoulder using a big leaf maple bark sling for over a mile through the woods and didn’t lose any water in the process. 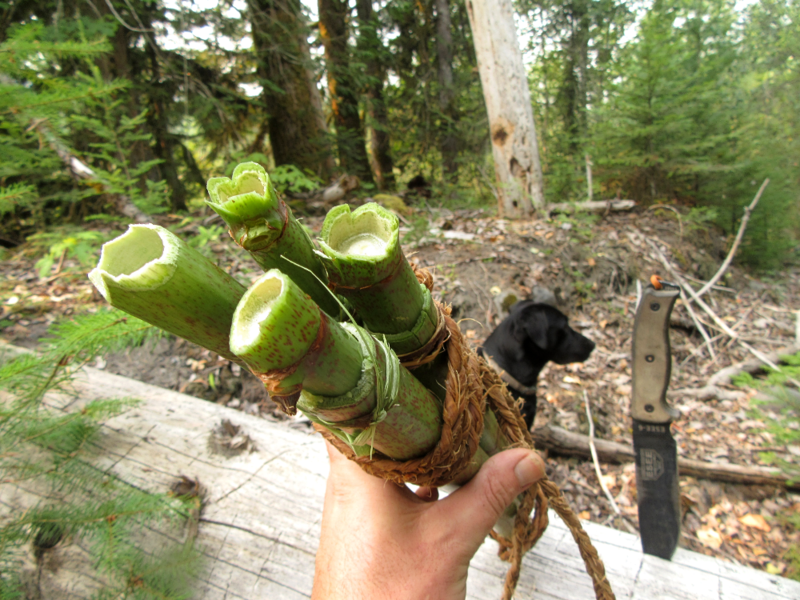 I tasted the water and the knotweed didn’t seem to impart any flavor to it Once we get some rain to diminish the fire danger, I will see if I am able to boil water in these. M.Hatfield, D.K, Brook Trout and 7 others like this. M.Hatfield, Brook Trout, Medicine maker and 4 others like this. 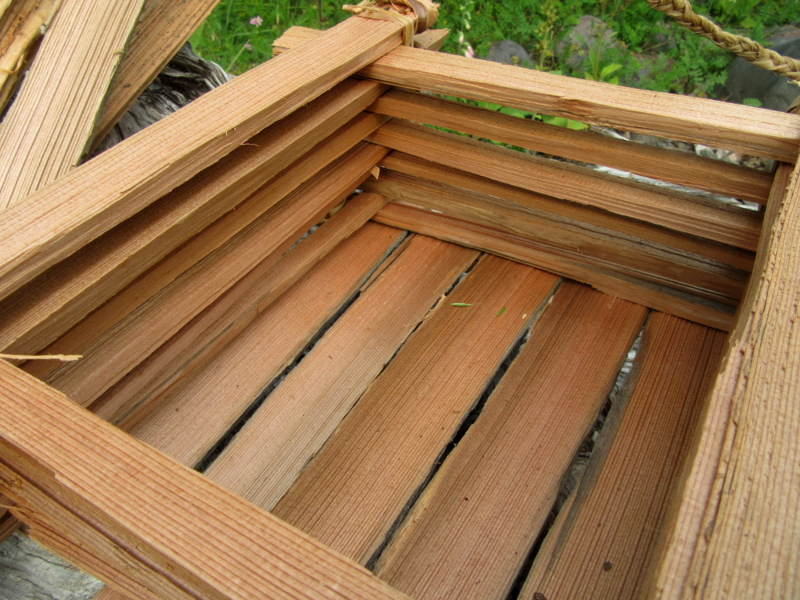 Anyone make a char box from bamboo? Brook Trout, rsnurkle, CivilizationDropout and 1 other person like this. M.Hatfield, CivilizationDropout, Jim L. and 1 other person like this. Today's basket creation!! Used the same little green wetland plants..
M.Hatfield, Brook Trout, hidden_lion and 4 others like this. CivilizationDropout and NWPrimate like this. My first go at a bamboo container. I went for simple.. cut a short piece and left the node. I got some super thick leather for Christmas and wanted to try it for a stopper. I still think I'll make another with a wooden stopper. Brook Trout, Carabnr, rsnurkle and 3 others like this. MisterHoodoo, Brook Trout, hidden_lion and 8 others like this. D.K, Brook Trout, Medicine maker and 5 others like this. Brook Trout, NWPrimate and rsnurkle like this. Road King, OrienM, Brook Trout and 6 others like this. Easter is coming. Small scale practice with split cedar roots. OrienM, Brook Trout, Medicine maker and 4 others like this. This was a good learning experience. It took way longer than expected and didn't come out looking like I envisioned, but I've got my foot in the door now and am more interested in developing this skill than I was yesterday. Brook Trout, CivilizationDropout, Revinmama and 1 other person like this. Medicine maker, CivilizationDropout and rsnurkle like this. Has anyone heard of the tinder horn? NWPrimate and CivilizationDropout like this. How did I knot know this thread exists! NWPrimate, rsnurkle, Medicine maker and 1 other person like this. NWPrimate, rsnurkle, OrienM and 2 others like this. 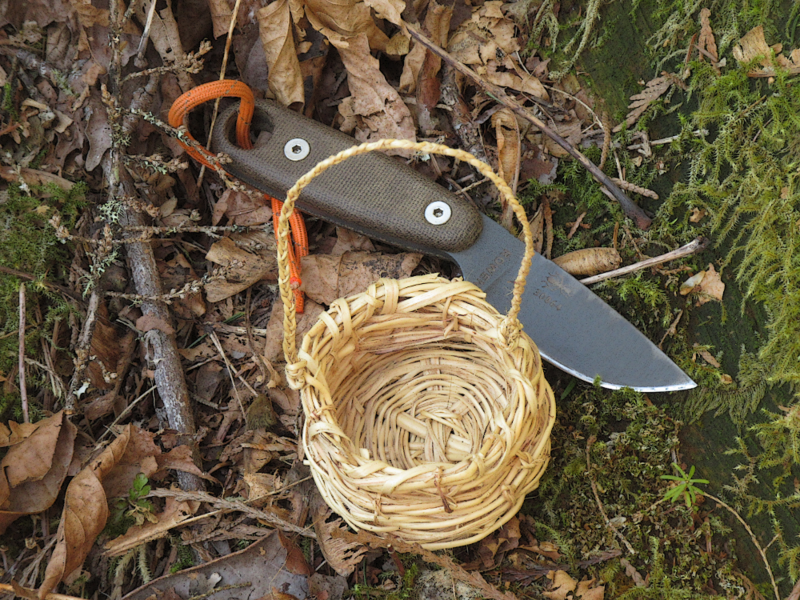 It took several failed attempts, but I eventually ended up with a functional woven willow basket. Revinmama, CivilizationDropout and rsnurkle like this. 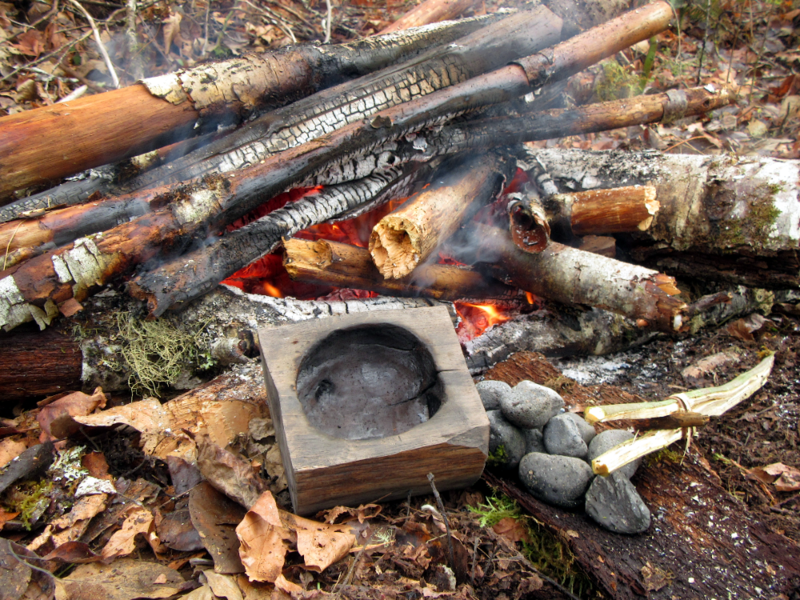 Birch bark is durable and easy to work with. It is a very special tree. Revinmama, NWPrimate, CivilizationDropout and 1 other person like this. A needle case pulling double duty as a toggle, and two spice bottles. NWPrimate, CivilizationDropout, rsnurkle and 1 other person like this. mountainman11b, Revinmama, rsnurkle and 2 others like this. But Grandmother, what big teeth you have! NWPrimate, rsnurkle and CivilizationDropout like this. I didnt get to make one but my wife did. rsnurkle and CivilizationDropout like this.